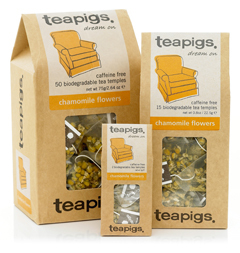 About teapigs chamomile flowersIt’s long been known that the best chamomile tea comes from brewing the whole flowers. So guess what we sell? That’s right, only the whole flowers of the Croatian chamomile bush. You may have noticed most other chamomile teas are made from crushed flowers, which in our view is a plain nasty thing to do. Equally, well known are the medicinal benefits of chamomile, which include calming, soothing anxiety and aiding sleep. Compare the whole flowers in our tea temples to the dust in your regular tea bag; whole flowers are best. Unable to switch off. One cup of this will calm any incessant mind-whirring, especially if you put your feet up while someone else makes it for you.